Metal maniacs, rejoice! 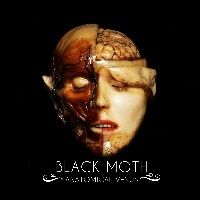 I am proud to present to you: BLACK MOTH; signed via Candlelight Records, hailing from England - performing Doom/Stoner Metal/Rock, on their 3rd album entitled: “Anatomical Venus” (released March 2nd 2018). Since formation in 2010; the quintet in question have 2 albums behind them, I am introduced to their 3rd album entitled: “Anatomical Venus”. 10 tracks ranging at around 45:12… BLACK MOTH arrange an intricately designed formula of heavy-hitting Doom/Stoner Metal/Rock developments; starting off with “Istra”, these amalgamations are well executed - from the Doom extremity, to the Stoner ambiency and the bouncy Rock elements combine a distinctive aesthetic which has a fluid substance of organic catchiness. The melodious rhythms and consistent flamboyancy deliver a crunchy experience, constructing a grandiose manifestation of concrete performances which demonstrates a solid slab of proficient adroitness. Consisting of Dave Vachon on the powerhouse bass, who showcases pulverizing effectiveness in the song “Moonbow”. The sound production is audible, yet maybe a little distorted - yet pummels with dynamic results. Dominic McCready on the drums provides a distinguished flavour of crushing efficaciousness in the next song “Sisters Of The Stone”, distributing complex dexterity and efficiently filthy riffs and solos from guitar duo Jim Swainston & Federica Gialanze - who embellishes on groovy contrast and diverse variety as they rapidly swift with battering assaults of rampaging grit and stability. “Buried Hoards” & “Severed Grace” persistently establishing more chaotic mayhem, as the band composes with detailed creativity in the songwriting department. Harriet Bevan on vocals most notably attributes with clean, high-pitched singing with a hint of rawness for good measure. “A Lover’s Hate” examines the haunting yet vicious tones which hammers with a blistering onslaught of craftsmanship and polished skill, thunderously thumping like a bolt of lightning - juxtaposed with the electrical madness. “Screen Queen” converges captivating hooks and the aforementioned assortments, flourishing with vehement orientation which excels with exquisite entertainment. “Tourmaline” is a unique one; with its relentless barrages of riveting originality and frenzied, progressive technicalites that balances memorable characteristics and savagely sinister ramifications. “A Thousand Arrows” orchestrates straight-edge sharpness, full of finesse and melodic Rock ‘N’ Roll with the primitive styles of Doom/Stoner presentations. Overall concluding “Anatomical Venus” with the finale track “Pig Man”; my expectations were exceeded, though the record has a couple minor flaws of excessive loudness and distortion… that did not bother me too much as this was still a good discovery - worth experimenting.